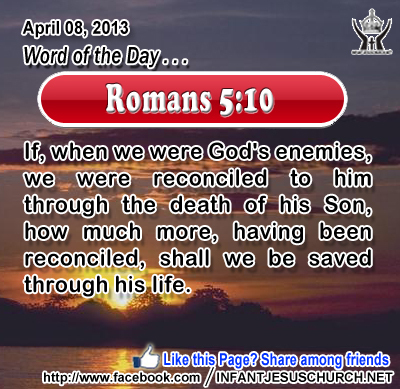 Romans 5:10: If, when we were God's enemies, we were reconciled to him through the death of his Son, how much more, having been reconciled, shall we be saved through his life. 1Now there was a man of the Pharisees, named Nicode'mus, a ruler of the Jews. 2 This man came to Jesus by night and said to him, "Rabbi, we know that you are a teacher come from God; for no one can do these signs that you do, unless God is with him." 3 Jesus answered him, "Truly, truly, I say to you, unless one is born anew, he cannot see the kingdom of God." 4 Nicode'mus said to him, "How can a man be born when he is old? Can he enter a second time into his mother's womb and be born?" 5 Jesus answered, "Truly, truly, I say to you, unless one is born of water and the Spirit, he cannot enter the kingdom of God. 6 That which is born of the flesh is flesh, and that which is born of the Spirit is spirit. 7 Do not marvel that I said to you, `You must be born anew.' 8 The wind blows where it wills, and you hear the sound of it, but you do not know whence it comes or whither it goes; so it is with every one who is born of the Spirit." Jesus' discussion with Nicodemus went to the very heart of the Mosaic Law - how can one get right with God and enter God's kingdom? Jesus' reply was brief and startling: "Unless one is born anew, he cannot see God." The new birth which Jesus spoke about was not a physical birth but the starting of a spiritual birth which is something completely new and fundamental, and from above, namely from God himself. Jesus said that this rebirth was essential if one was to enter God's kingdom. Nicodemus thought that to be born again, even spiritually, was impossible. He perhaps knew too well from experience that anyone who wants to be changed can't change himself. Jesus clarified that this change could only come about through the work and action of the Holy Spirit. This rebirth in the Spirit is very real and experimental, like the wind which can be felt and heard while it is visibly hidden to the naked eye. Loving Jesus, you offer us a new birth in the Holy Spirit. Renew in us the gift of faith and new life in your Holy Spirit. Help us to draw near to you and to believe in your life-giving word. May your kingdom come and may your will be done in our life today, tomorrow, and always.